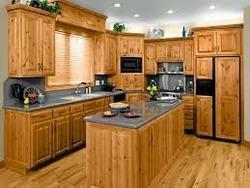 Leading Manufacturer of wooden kitchen and wooden kitchen cabinets from Faridabad. We manufacture and supply Wooden Kitchen. Used in commercial or household kitchen, the rendered designer kitchen furniture is known for its elegant design, contemporary and sturdy construction. To meet the precise needs of our patrons, we render the designer kitchen furniture is various standard sizes and dimensions. 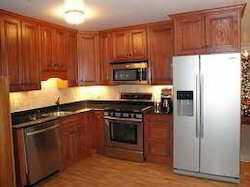 We manufacture and supply Wooden Kitchen Cabinets. Used in commercial or household kitchen, the rendered designer kitchen furniture is known for its elegant design, contemporary and sturdy construction. To meet the precise needs of our patrons, we render the designer kitchen furniture is various standard sizes and dimensions. Looking for Wooden Kitchen ?